Friday is admin day for me. Time to shuffle papers, record transactions and file it all away in binders and computer folders. It's the yin to the yang and has to be done. Sure does remind me this jewelry business is just that...a business. So, to make it fun, I put my favorite music in the cd player, open the window to let the sun and fresh air flow and enjoy that I get to do this all from home and tell myself that as soon as this is finished, I can play with clay, beads and silver. Ahhhh, now that's what it's really all about. I just had the best business day ever so far yesterday. It was full of marvelous surprises all day long and provided a wonderful energy...not hyper, just smooth and steady to keep me working into the night. So that inspiration I was looking for in my previous blog? It came along big time! I had the joy of snatching a few hours of being featured on the famous cupcake blog "Cupcakes take the cake" which brought some business my way. I also learned that somewhere in the glass bead world RockerJewlz is becoming synonymous with cupcakes. So I'm getting to where I want to be and loving it. Four to five days a week I post a new piece of jewelry on my Etsy site, rockerjewlz.etsy.com. Be sure to stop by there as well as www.RockerJewlz.com since they don't share the same jewelry designs. It's fun because you can shop according to mood...either an exciting public site at Etsy or a more intimate experience shopping with just me. They both feature Paypal, so whichever mood you are in, I've got you covered. I DO have elegant pumpkin earrings on both sites. No corn ball designs here...these are exquisite! I'm looking for inspiration today. 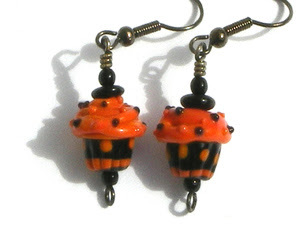 I have a cupcake earring order to finish and mail and then have a couple of errands to run. While I'm out there, maybe I'll find something during a regular day that will inspire me to create something new. Let's go shopping! I joined a fabulous shopping site called Etsy where only hand made items in every conceivable category are available. There's something special about knowing that each item you purchase there contains the heart and soul of its maker. Ebay seems like a big slug to me these days and I got tired of hoping to win auctions. Sometimes I just want to buy what I want to buy...you know? I found Etsy just in time and it is so easy to shop there. I picked up several warm felted fashion accessories to add to my winter wardrobe. Swing by the shop by clicking here: chewyv.etsy.com and let's go shopping! October equals Halloween. Can you believe these awesome cupcakes? Who would have thought of cupcakes in a Halloween format! Why, Payton Jett, of course. She's always challenging herself to create new and clever designs and she sure hit the mark this time. 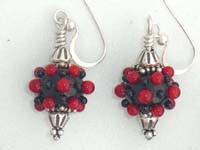 At www.RockerJewlz..com you can also find pumpkin earrings that are delicate, sweet and elegant. They are so realistic it's amazing. So, come visit the pumpkin patch at RockerJewlz and nab yourself some one of a kind jewelry that will make you the talk of the town.